Could Grace Jones really have been that tall when she wore Azzedine Alaïa‘s fuchsia satin bandage dress back in 1985. 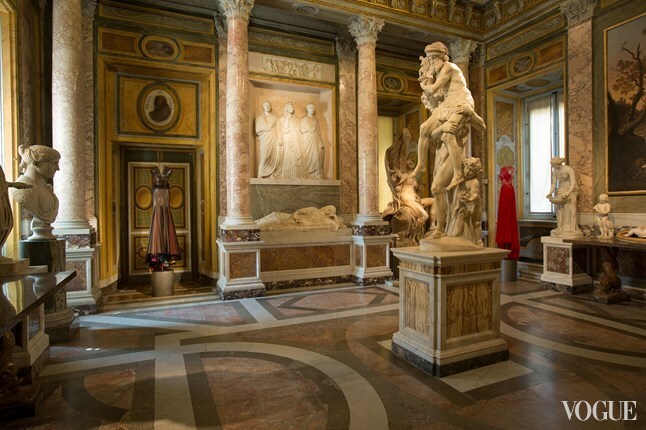 The display mannequin rises up like a pillar towards the frescoed ceiling in the entrance hall of Rome’s Borghese Gallery. 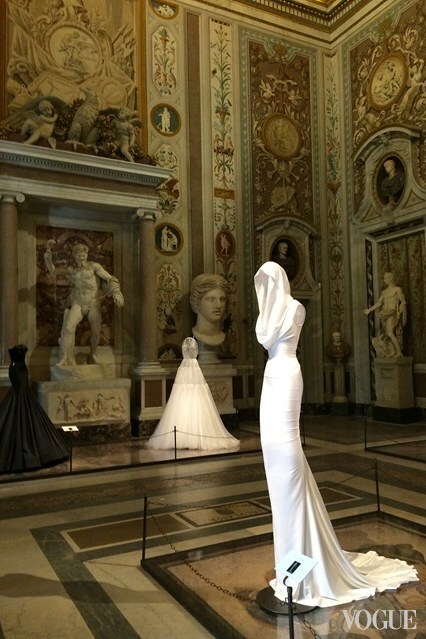 “I made a new copy of the dress to get the proportions right,” said Alaïa as he walked me around 20 rooms in this historic Roman villa. 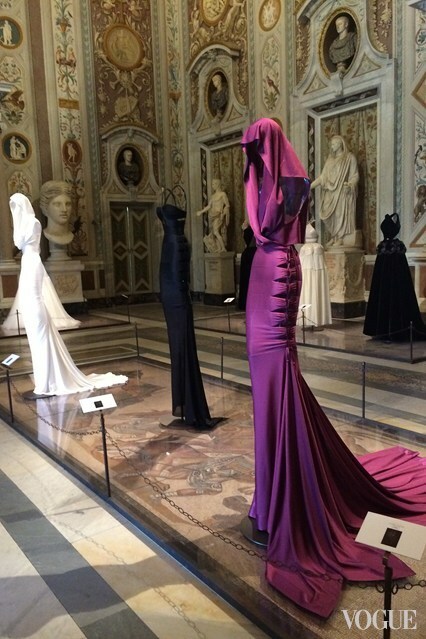 Couture/Sculpture (until October 25) is the museum’s take on Alaïa in the history of fashion. 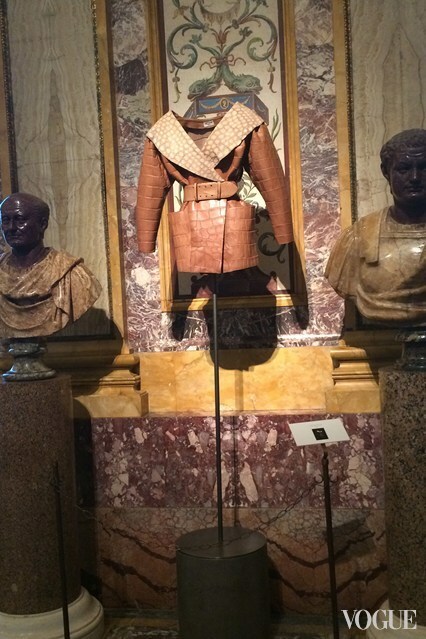 It includes 65 outfits placed like art objects among the existing pieces from monumental artists such as Bernini, Canova or Caravaggio. The starting pieces, re-made by Alaïa to a greater height to face off the soaring space, are followed by other clothes, all selected by curator Mark Wilson. His role was to choose in just three months the most appropriate objects that he then used to enhance or meld with Alaïa‘s work. 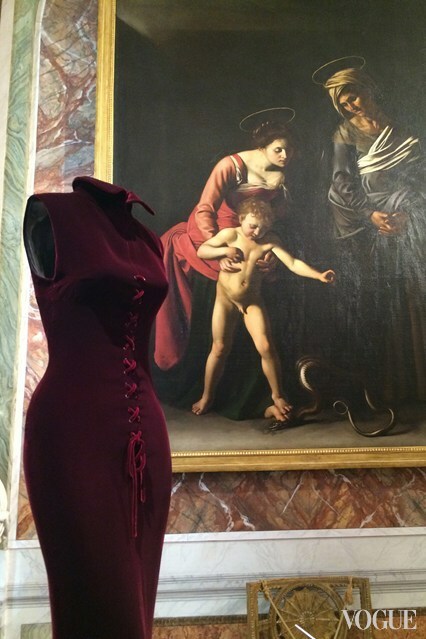 So a plain white dress might be placed between marble statues, while a laced-up velvet dress in a deep wine red faces off the underlying violence of Caravaggio’s paintings. Mark Wilson, who has worked on a variety of Alaïa exhibitions and is curator of the Groninger Museum in the Netherlands, explained how he had searched for visual connections between the historic museum pieces and the designer’s work. The concept was to place the clothes in chromatic harmony with the objects in situ. 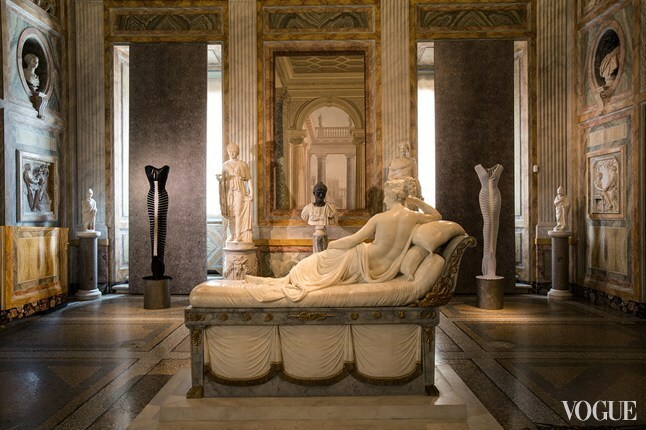 The juxtapositions included a raffia dress thick with texture in the room where the central sculpture is Bernini’s statue of Apollo and Daphne, while Alaïa‘s bandage dresses hint at mummified bodies in the palazzo’s Egyptian room. There, too, hangs the designer’s crocodile coat that seems almost alive. 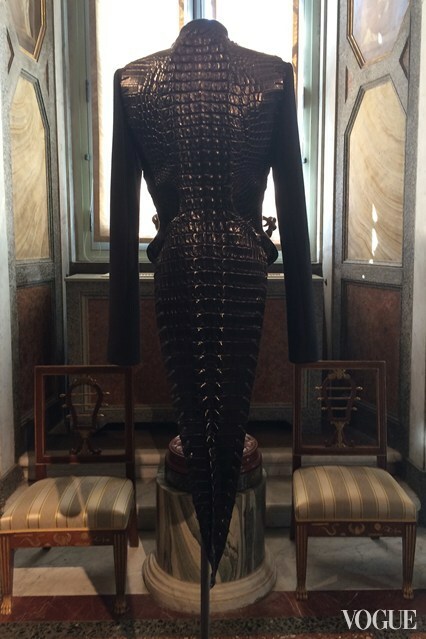 The two-floor intervention of fashion and art – a subject much flaunted in current fashion – reaches a crescendo with a golden creation: a dress originally made for Tina Turner. While a line of black outfits looks a little too much like a fashion showroom. 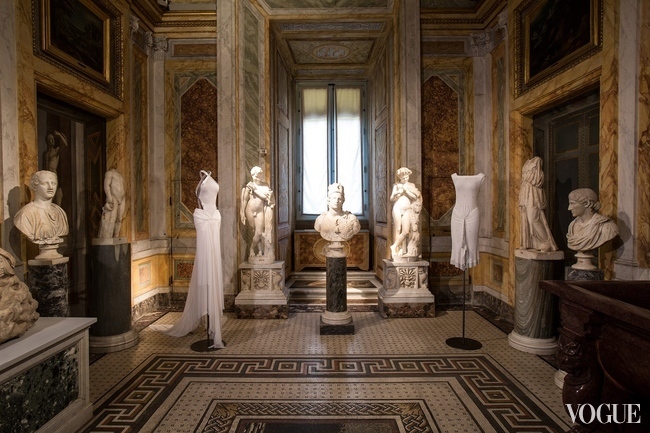 Anna Coliva, the director of the Borghese Gallery, said that her original title for the Alaïa exhibition was Soft Sculptures, and that she had never intended for there to be a focus on fashion. The fact that the opening had fallen the night after Valentino showed Alta Moda in Rome, bringing in the fashion crowd, was serendipitous. 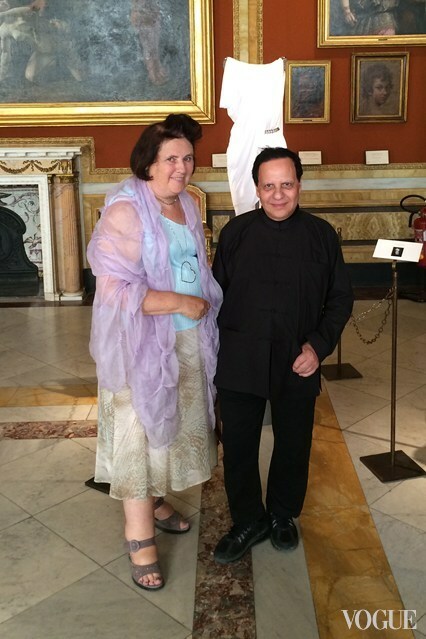 A dinner for Alaïa at the French embassy in the Palazzo Farnese should have been the Tunisian-born designer’s proud moment. But, overwhelmed by the rigours of the opening, he declined to attend. 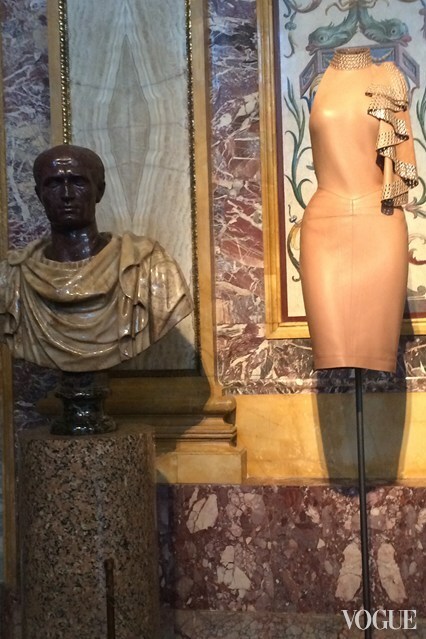 However, his supporters were present, including milliner Stephen Jones and fashion historian and curator Olivier Saillard, who gave Alaïa a Paris exhibition at the Palais Galliera in 2013. 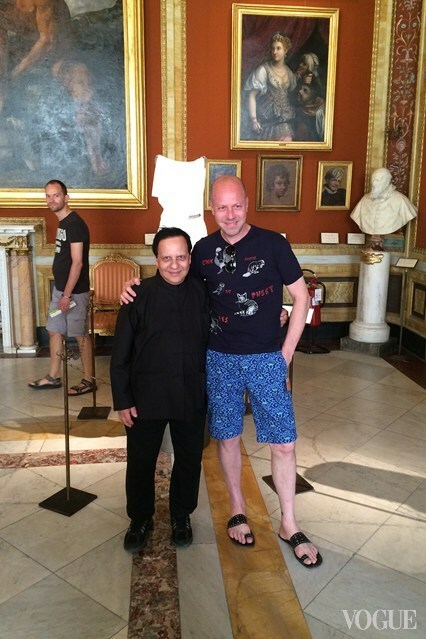 “He is an artist,” said Mark Wilson of Alaïa and his work. But the designer quietly corrected the curator.